Native American Teepee Playset is an amazing wooden pretend play set complete with a standing cotton Teepee. 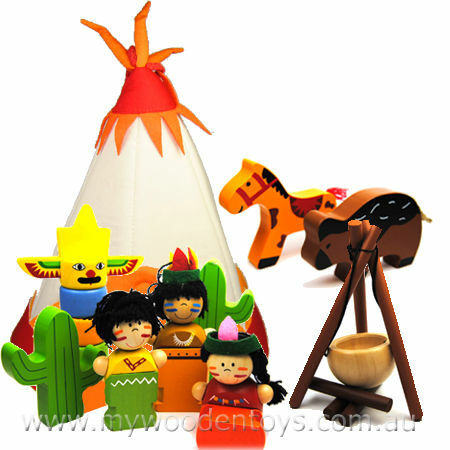 This set comes with three wooden Native American characters all with striped faces and head dresses. They can all, at a twist of their bodies, sit down or stand up. The Teepee is made of material, has a base, opening door and stands by itself. The Teepee has lovely felt decorations and a carry loop on the top. All the sets pieces can be stored inside it. Also included is a cooking pot on stand, logs for a fire, a Bison and Horse, Cacti and a Totem pole. Size: Teepee stands 30cm high. Characters are 9cm high. We like this because: "Lovely set beautiful Teepee "